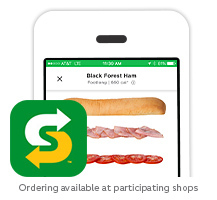 Today, the SUBWAY® brand is the world's largest submarine sandwich chain with more than 44,000 locations around the world. We’ve become the leading choice for people seeking quick, nutritious meal options that the whole family can enjoy. From the beginning, Fred has had a clear vision for the future of the SUBWAY® brand. As we continue to grow, we are guided by his passion for delighting customers by serving fresh, delicious, sandwiches made-to-order right in front of you.